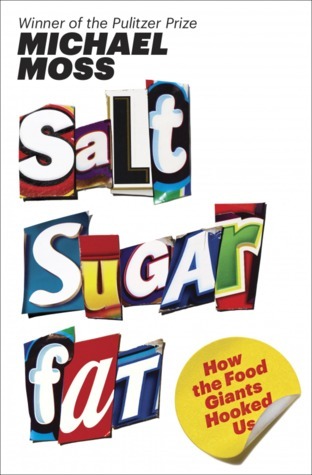 Michael Moss' book Salt Sugar Fat: How the Food Giants Hooked Us has gotten a LOT of attention in my world since it came out. Full disclosure: I work in the processed foods industry and my company gets quite a bit of coverage in this book. Every year, the average American eats thirty-three pounds of cheese (triple what we ate in 1970) and seventy pounds of sugar (about twenty-two teaspoons a day). We ingest 8,500 milligrams of salt a day, double the recommended amount, and almost none of that comes from the shakers on our table. It comes from processed food. It’s no wonder, then, that one in three adults, and one in five kids, is clinically obese. It’s no wonder that twenty-six million Americans have diabetes, the processed food industry in the U.S. accounts for $1 trillion a year in sales, and the total economic cost of this health crisis is approaching $300 billion a year. In Salt Sugar Fat, Pulitzer Prize–winning investigative reporter Michael Moss shows how we got here. Featuring examples from some of the most recognizable (and profitable) companies and brands of the last half century—including Kraft, Coca-Cola, Lunchables, Kellogg, Nestlé, Oreos, Cargill, Capri Sun, and many more—Moss’s explosive, empowering narrative is grounded in meticulous, often eye-opening research. I read this on audiobook, so I can't share with you the many terrifying statistics and sad stories that make this book so compelling. In a way, it's probably nothing you haven't heard before - America has an obesity crisis, and most of the sugar, salt, and fat that Americans eat comes from processed foods. From breakfast cereals that have more sugar than most desserts to frozen dinners that contain more than 2 days worth of sodium to meats with significant amounts of saturated fats, we are eating ourselves into a very dangerous place. It may sound like this book is written like an alarm bell, filling your eyes and ears with statistics and dry facts that frighten you but are also boring and hard to digest. This is not the case at all. Moss is a fantastic writer. He has amazing sources from all over the food spectrum - he interviews Howard Moskowitz, the man behind the recent successes of both Prego and Dr. Pepper. He goes into a research laboratory and learns that humans have no upper limit to the amount of fat they crave. He tells us that what we know about the different areas of the tongue being sensitive to different tastes is wrong - the entire tongue is sensitive to sugar and wants more of it. He mentions that while it's not too hard to cure an addiction to sodium, just by decreasing the amount of sodium you ingest over a few weeks, it's not nearly as easy to curb cravings for sugar or fat. As soon as you taste sugar again, you want more of it. And there are no warnings that come from your brain telling you that you've had enough fat. Moss shares both the science behind and the impact caused by processed foods - how companies spend years on formulations that are exactly what people want to taste, how their drive for profits often comes at the expense of nutrition, and how the government that should be a consumer advocate is instead highly ineffective and often more in line with the dairy and meat lobbies than with consumers. The last food book I read that had an impact on me was Animal, Vegetable, Miracle, which I really enjoyed, though found a bit preachy. Having read Salt Sugar Fat, I must say I prefer Moss' book. He is much more realistic in his approach, acknowledging just how good processed foods can taste, and just how much time they save us in a day. He also points out that food companies exist to make money, not to make people healthier. The only way that they will make foods healthier is if they are required to do so by law, so that they are all on equal footing. Otherwise, it's the classic economic prisoner's dilemma - they will all act defensively against each other due to the fierce competition that exists between them. Moss isn't preachy, he's realistic. He's sympathetic to all sides - the companies that produce consistent, tasty food for the masses, the government entities that struggle to make a difference on tiny budgets, the farmers who need to earn a living by pushing people to eat excessive amounts of meat and cheese, the families who can't afford to buy fresh food, so buy the cheaper processed food instead. But he's also frustrated. It isn't right that beef can tout its protein and zinc levels on the front label without mentioning anything about the amount of fat. It's not ok that Frosted Mini Wheats can be marketed as good for memory and say nothing about the high sugar content. It's all a very messy and misleading way of sharing (or hiding) information, meaning that people can think that they are buying healthy food when they really are doing just the opposite. As someone who makes a living selling a product that she doesn't consume, I really struggle with this dilemma. I can understand why a lot of the blame is on the packaged foods companies, but I don't think it's fair to put all the blame there. After all, they are almost all publicly traded entities that report earnings to shareholders - and when they don't report profits, the market is unhappy. This implies that people in general don't really care about how a company makes money and don't really think it's up to these companies to worry about anything but making money. Which then leads us to the government. If companies cannot self-correct their course, then isn't it up to the government to step in as the consumer's advocate and set rules in place that the companies must follow? Yes. Except that the government is very worried about people losing jobs. And it supports the price (and vast overproduction) of meat and dairy products, so it wants those to sell well, which is in direct opposition to helping America get healthier. So we're left with the consumer shouldering all the work - balancing the cost of food against its content, weighing whether convenience or nutrition will win out, and being forced to spend minutes of precious time at the store looking carefully at the labels to see whether the product really is what it says it is. And the consumer just doesn't have time to do all this - after all, that's why processed foods were invented in the first place. This was a really good book. The underlying information - that we consume too much sugar, salt, and fat to be healthy - is not groundbreaking, but the case studies and interviews and background information are all fascinating and will change the way you look at the American food system. Highly recommended. I read the article The Extraordinary Science of Junk Food in the NYT magazine (http://www.nytimes.com/2013/02/24/magazine/the-extraordinary-science-of-junk-food.html?pagewanted=all) a few months back and wanted to read more about the subject since it's beginning to affect the health of my family and friends. So I'm really glad you posted about this book. It's rather a scary thought that companies have spent millions just to get us hooked onto foods which we don't give much thought to when we eat them. But I'm glad that we are finally getting information that will, hopefully, make us rethink how we feed ourselves. Yes, that article was written by Michael Moss, the author of this book - in fact, it's an excerpt from this book. I never thought before of it in the way that you mention - that they spend so much time trying to find a perfect version of something that we all eat mindlessly. That IS scary. My hub and I try to resist 'processed food' and I think we do a good job. But now that I'm working, I've become addicted to granola bars - one for breakfast, one for lunch and I honestly can state that I have not looked at a label! Fast and convenient rules. It's hard sometimes. I know, it really is a struggle, isn't it? What would be ideal is if processed food companies would really work to provide healthy food - and I think they ARE trying, but it would be easier for them and for us if the government just made it mandatory. I have this on audio too, and it sounds like I need to listen to it. I admit that I have relied a lot on processed food in the past, but the more that I get older, and the more my diabetes advances, the more I cook homemade meals, and relay more on veggies and not meat. I still like cheese, and it is an excellent source of protein, but not the processed stuff. The only thing I can't give up is ice cream sometimes, which is ok, in moderation. It't true that the magical formula is a savings in time and revenue for the companies, but at what expense. I will be reading this one and getting back to you in email, for sure! Oh, SO GLAD you have it on audio! I can't wait to hear what you think. Ice cream is hard to give up, especially if you live in Florida! I hope more people go back to cooking meals - I think we've lost so much knowledge in how to take care of those things for ourselves, and it's really unfortunate. This makes me sad in the way that a lot of arguments do when it ends up coming back to the fact that business runs our lives, and money is literally the only thing business cares about. I'm not going to go off on my anti-capitalist rant, but ugh. Especially because I don't like cooking. Really hate it, actually. Sigh. That's actually what I appreciated about Moss' book - it is NOT an anti-capitalist rant. While I understand the fear when businesses are out for money, I also think that, quite frankly, capitalism seems to work and respond better than a lot of other systems do, but the government is just required to step in and make sound judgments and rules where businesses won't. I read the NYT article too. I sort of feel like if the government wants to regulate other addictive substances, it should regulate sugar, OR, stop regulating other mood elevators! Ooooh, this sounds like exactly the kind of book that I need to read- I'm all about the 'ARRRRGH, what is in our foods and what can we DO about it?' kind of thing. Veeery convincing review too, ma'am!